Security Defender (or Defender Pro 2015) is a fake antivirus that imitates Microsoft’s own antivirus utilities, Microsoft Security Essentials and Windows Defender. Once it gets inside a computer, Security Defender starts to show a lot of alerts about suspicious behavior, “finds” dangerous viruses during scans and prompts the user to buy Defender Pro 2015 to get rid of found threats. In reality, Security Defender is the threat here, and you shouldn’t believe its claims. The sooner you uninstall Security Defender, the better. Is Security Defender a Virus? It is certainly malware, or, to be more precise, scareware. Scareware, or rogueware, are programs that often get installed sneakily and tell user that something is wrong with his or her computer: viruses are detected or a critical error occurred. That is done to scare the user into paying for the product that will not, in the end, do the system any good. If you are not sure whether an alert you see is from a genuine Microsoft product or from Security Defender, look at the program’s name. Also, real Microsoft Security Essentials and Windows Defender are free for Windows users and won’t ask you to pay for virus removal. Security Defender will resist your attempts to delete it, so the first thing you need to do is to reboot in Safe Mode: Security Defender will not launch and interfere with your actions in Safe Mode. 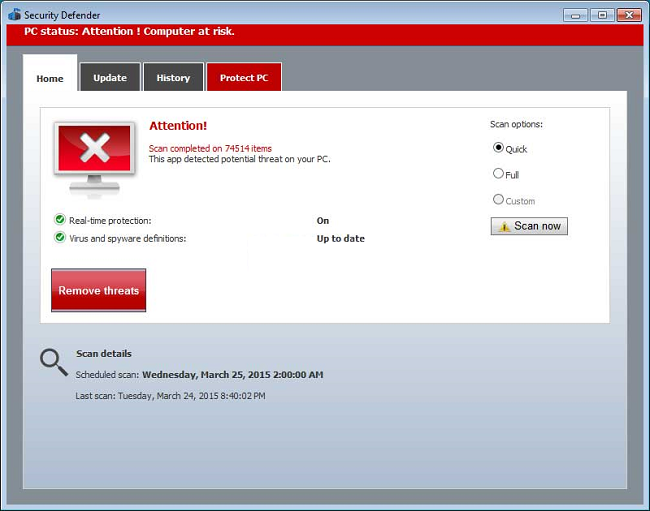 Download an anti-malware program that is capable of finding and removing scareware. You can also uninstall Security Defender yourself by following the instructions below. In the Start menu select Setings => Control Panel. Look for Newsearch123.com in the list. If you find the app, highlight it. Don’t turn off User Account Control and don’t use an administrator account in Windows Vista and newer Windows. Malware can do much less damage on guest accounts than otherwise. Don’t download software from unverified web-sites. You can easily download rogueware; or some unwanted programs could get installed along with the app.